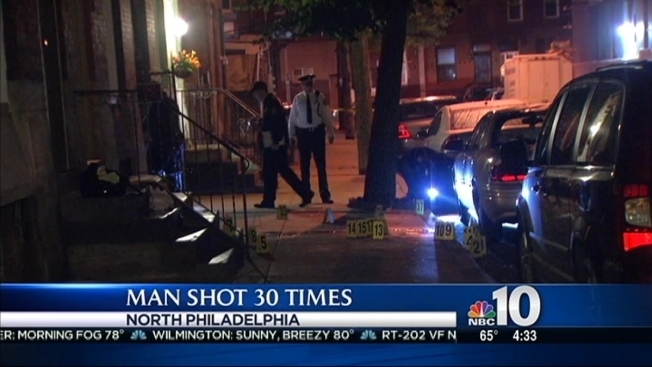 A 24-year-old man is dead after a gunman shot him 30 times on a North Philly street early Tuesday morning. Two suspects approached the victim and a woman, who were sitting on the front steps of a home on the 2100 block of Uber Street, around 12:30 a.m. and began firing, police said. The pair fired at least 32 rounds, killing the man and wounding the woman, who was hit in her ankle, authorities said. The suspects ran away from the scene and were last seen heading north on 19th Street, investigators said. Police have not disclosed a motive in the crime. The suspects remain at large.